Visme provides over 6,000 (and growing) vector shapes and icons. Each is customizable and can be resized, rotated, flipped, and updated with desired colors. 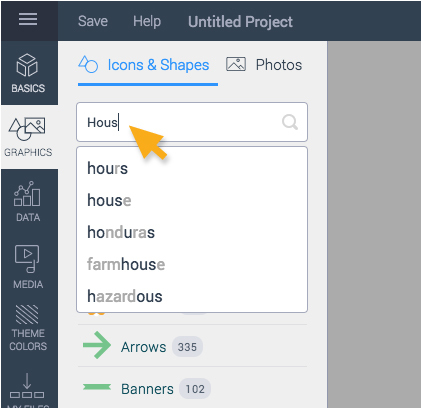 The shapes/icon library is divided into sections and can also be searched by keywords. 1). Simply click on Graphics from the left panel and hover your mouse over and click on Icons and Shapes tab. 2). Search for a specific shape or icon by typing in a search term. As you type a word, the search engine will show you available keywords to search by. Or Select from one of the categories listed. 3). When you have decided on the shape or icon that you want, you can place it in your project by either clicking on it or dragging-and-dropping it into place on your project. To replace an icon, simply click on the shape or icon you wish you replace. Once selected, click Replace icon at the top left of your screen. You will notice that it will automatically generate the similar icon types for you to choose from on the left panel under the Icons & Shapes tab. Once you have clicked on the new icon, it will automatically replace your previous icon with the new one.